Find your Zen. 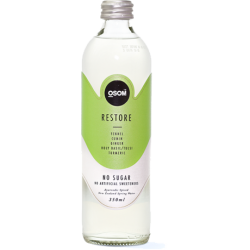 Brand new to the market, OSOM Ayurvedic Spiced New Zealand Spring Water is made with authentic Fair Trade Ayurvedic spices with zero Sugar and zero artificial sweeteners. OSOM has a unique flavour profile that has to be tried to be believed. OSOM Ayurvedic Spiced New Zealand Spring Water has been designed to provide specific natural detoxifying, calming and restorative benefits for consumers looking for holistic hydration for body and mind. Amazingly - OSOM can be enjoyed chilled, ambient or warmed. OSOM is finding strong demand from consumers looking for something new in the healthy beverages market. Be in early to stock OSOM and lead the way with a new beverages offer your customers will love. For reseller enquiries contact Ashon Ventures NZ Limited.